MANILA - Vice President Leni Robredo hit back Friday at President Rodrigo Duterte after the chief executive belittled anew her capabilities as a public official. Robredo in a statement said there was no justifiable reason for the President to underestimate her by saying that she was “weak” as a leader. “Wala namang may gustong magkasakit ang Pangulo. Pero hindi dahilan ang sakit para maliitin na naman ako,” she said. The President on Thursday described Robredo as "weak" as he again mentioned his preference of having the country ruled by a military junta. He made the comments on the same day he admitted undergoing a medical checkup, where doctors found a growth in his digestive tract. “Sa totoo lang (to be honest), even her public statements — I don’t mean to offend the lady, she’s very good, she’s gentle, pero mahina talaga (weak) si Leni,” Duterte said. The Vice President also stressed that the strength of a public official is not measured by his or her scathing words. “Hindi ko ugali ang mamulitika; mas gusto kong tahimik na magtrabaho. Pero sasabihin ko ito ngayon: ang tapang, lakas, at diskarte, hindi nadadaan sa mapanirang salita. Ang kailangan ng taumbayan ay tapang sa gawa,” Robredo said. 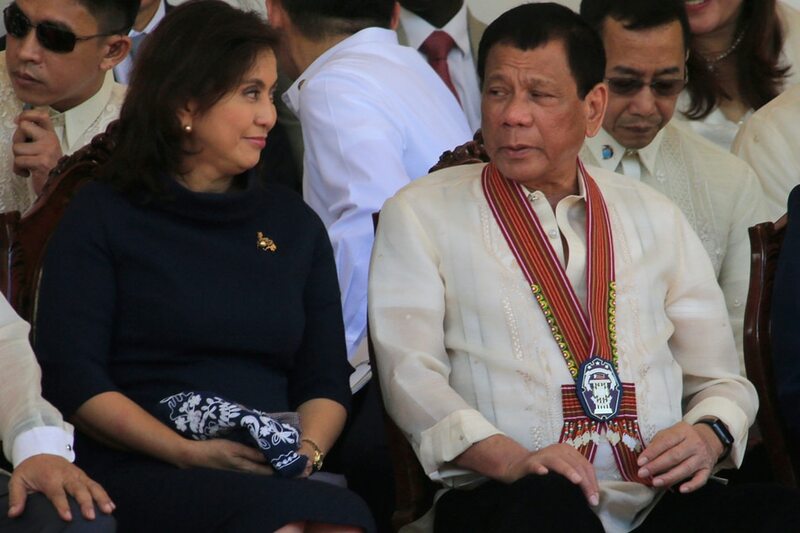 Robredo said the President should instead focus on lingering problems on the economy, which continue to hurt the poor, as well as allegations of corruption and extrajudicial killings in his administration. “Umaksyon tayo sa problema ng bayan, kaysa puro sisi ang binabato: sa dating administrasyon, sa kaniyang mga kritiko, sa akin," she said. "Sinumpaan naming mga lider na magtatrabaho kami para sa mga kapwa naming Pilipinong bumabangon araw-araw para mabigyan ng mas magandang buhay ang kanilang pamilya,” she added. Malacañang earlier said Duterte might make good on his promise to step down if former Senator Ferdinand "Bongbong" Marcos Jr. wins his poll protest against Robredo. Marcos has a pending protest against Robredo's May 2016 victory, the closest vice presidential race in recent memory that she won by 263,473 votes. A recount is on-going. Robredo was once part of the Duterte Cabinet, serving as housing czar. She, however, quit her cabinet post in December 2016 over policy differences with the President.